At Ocean Dental Care we have been practicing biological dentistry for over 15 years. Biological dentists recognize the impact of toxic materials and relate it to dental and physiological health. These dentists are concerned with the integrity of the oral cavity and use materials and procedures in their practices that are systemically compatible. We are a member of IAOMT (International Academy of Oral Medicine & Toxicology). The IAOMT is a network of dental, medical and research professionals who seek to raise the standards of scientific biocompatibility in the dental practice with information from the latest interdisciplinary research. 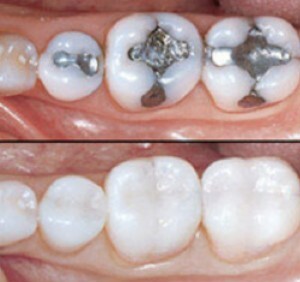 Many people do not realize the "silver" amalgam fillings are 50% mercury. A large filling may contain as much mercury as a thermometer. Mercury is the most toxic, non-radioactive element on the earth. Most medical and scientific researchers have called for a ban on the use of mercury in all products. However, the potential harmful effects of mercury fillings have been ignored by the U.S. Government. Due to its poisonous nature, mercury can adversely affect the immune, urinary, cardiac, respiratory and digestive systems. Under laboratory conditions, mercury has produced brain cell deterioration identical to that seen in victims of Alzheimer's disease. To prevent additional mercury exposure, Dr. Yamada has been properly trained in mercury filling removal. At Ocean Dental Care we take extra precautions such as isolating the tooth with the old filling with a type of dental raincoat called a rubber dam, to prevent any vapors or pieces of amalgam from entering your body. We also use a Dent Air Vac we like to call "Horton". This vacuum goes in front of the patient's face and removes any vapors that are created while removing the amalgam filling.